I am absolutely obsessed with tacos. a) they're beyond delicious, b) they're super versatile in what you can stuff in there (fish, veggies only, chicken, flank steak -- I love allllllll the tacos), c) you can dress them up with various salsas and guac (peach guac, sriracha corn salsa, this super summer-y watermelon salsa, etc. ), and d) everyone loves them. 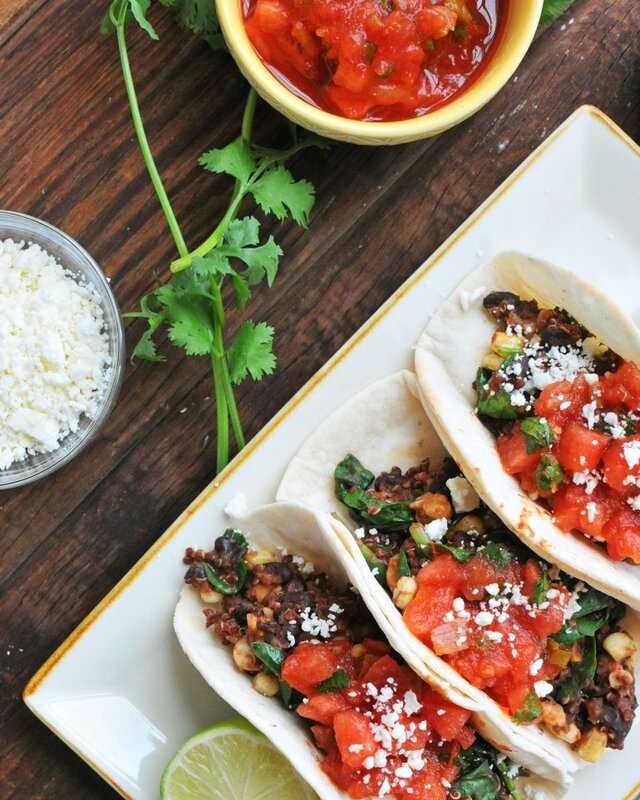 These new Beans and Greens Tacos with Watermelon Salsa are the epitome of summer --- with greens from the garden (or grocery store, lol) and juicy watermelon! They happen to be vegetarian AND amazing, made with a hearty combination of black beans, quinoa, corn, sauteed greens, and walnuts. 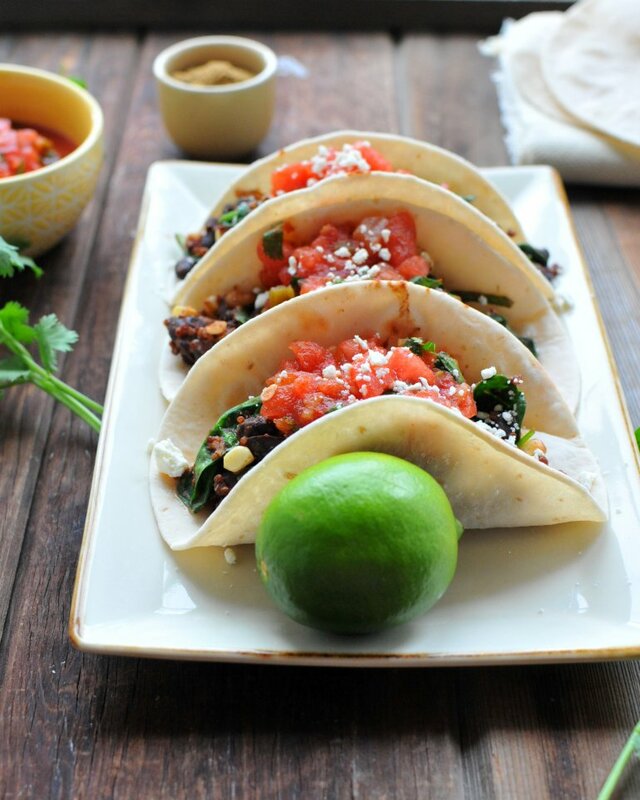 These tacos are an excellent source of plant-based protein as well as fiber and a plethora of vitamins and minerals. And the best part is... even picky eaters like devour them. 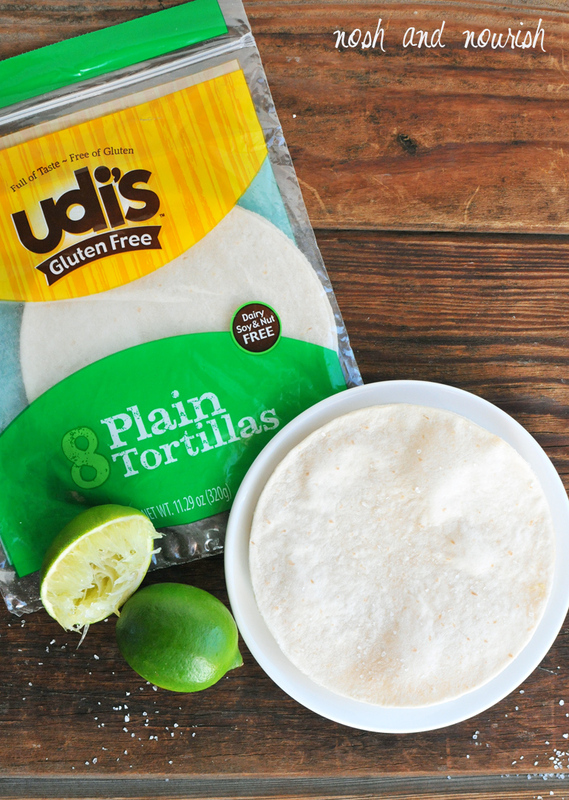 And whether you're gluten-free or not, these Udi's tortillas are worth trying --- seriously my new fav! 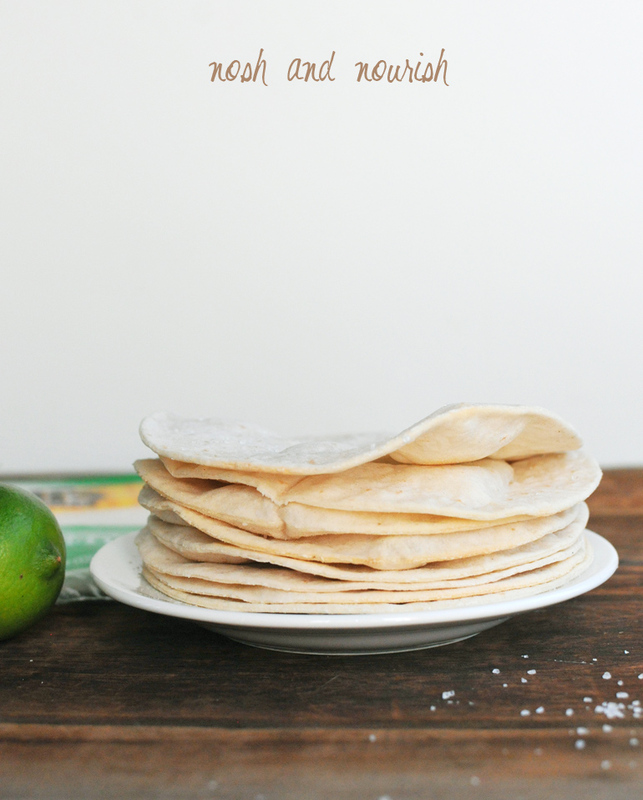 I honestly was super surprised by how much I liked these gluten-free tortillas!! As mentioned above, I eat a lot of tacos. At home. At restaurants. On the street. Which means I've eaten a lot of different tortillas in my life. And these are some of the best I've had. They do have a slightly odd texture straight out of the package, so I suggest baking them in the oven with fresh lime juice and coarse sea salt rather than just having them raw. They were like the perfect cross between a flour tortilla and a corn tortilla. And just look at how perfectly they bent up to hold all that yummy goodness. And... they kept their structural integrity throughout the entire meal. Yay for not breaking or cracking! 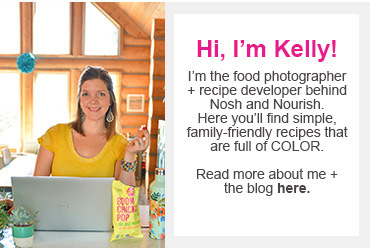 This is a sponsored conversation written by me on behalf of Udi's Gluten Free. 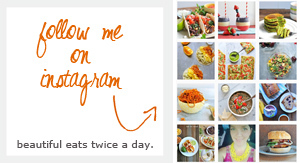 The opinions, recipe, beautiful photography, and text are all mine. Lay out the Udi's tortillas flat in a single layer on a baking sheet. Squeeze the juice from 1/2 a lime over the tortillas, then sprinkle with sea salt. Bake for 12 minutes, or until lightly browned. Then remove from heat and set aside. 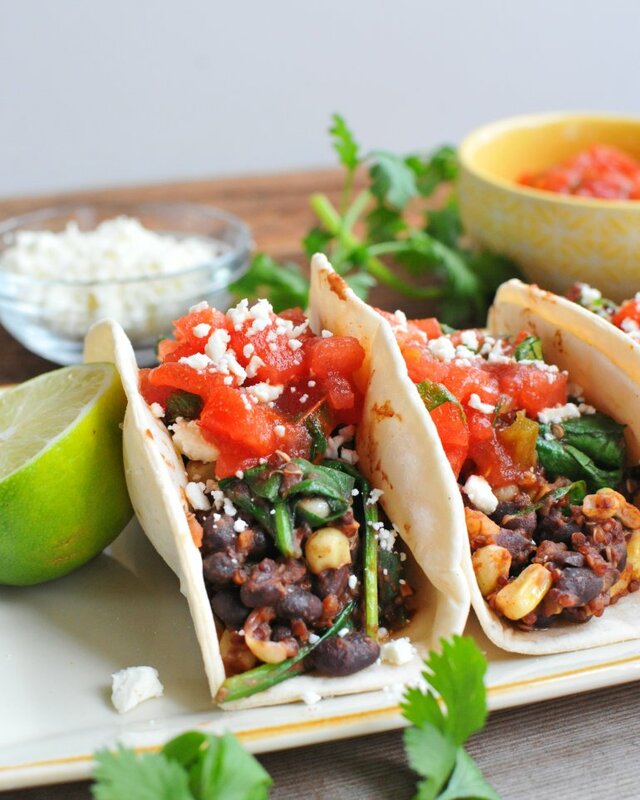 In a large skillet over medium-high heat, combine the taco filling ingredients: black beans, corn, spinach, quinoa, taco seasoning, walnuts, salsa, and cumin. Saute for 10 minutes or until heated through and spinach is softened/wilty. Meanwhile, in a small bowl, combine the watermelon salsa ingredients: diced watermelon, salsa, sea salt, paprika, cumin, and cilantro. Stir until thoroughly combined. Assemble your tacos! Grab a tortilla and then get a large spoonful of the heated taco filling, a large dollop of watermelon salsa, and a sprinkle of feta. Optional -- add avocado slices.